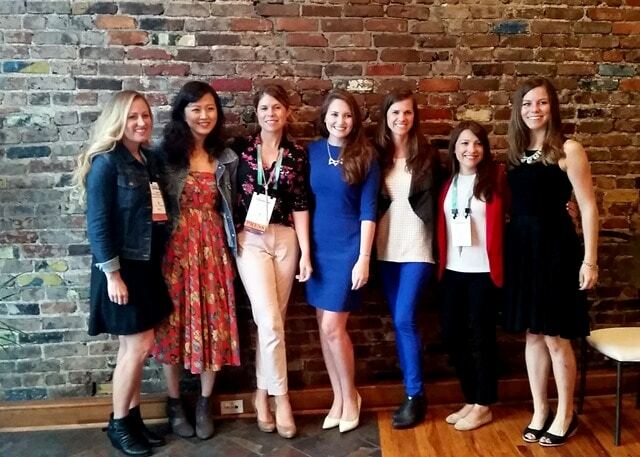 Wow – what a whirlwind the past week has been! 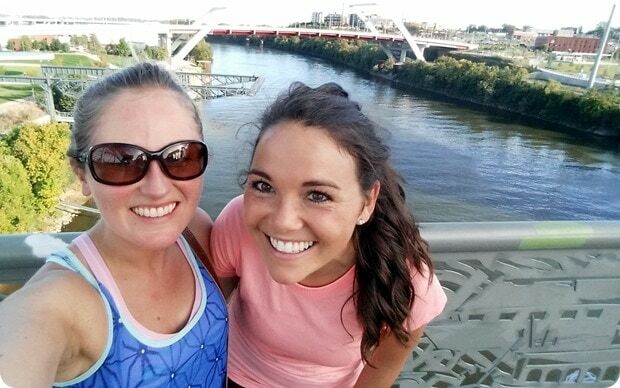 I’m home in DC now and wanted to share a recap of what I’ve been up to – from Friday to Tuesday, I was in Nashville, TN for FNCE, the massive annual Registered Dietitian conference. 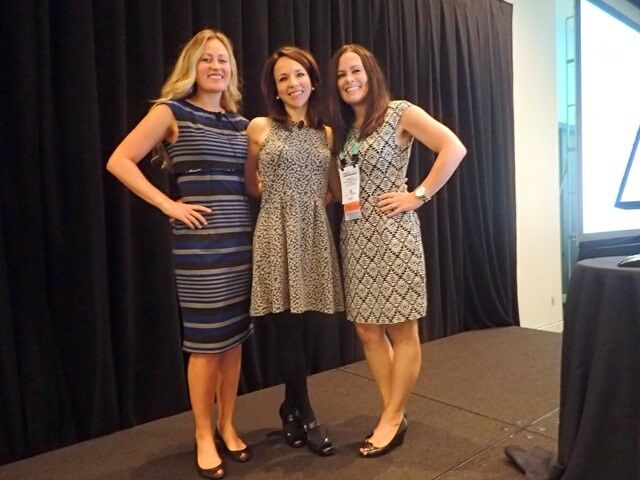 Nearly 10,000 dietitians from across the country attend, and it’s quite the event – 4 days of speakers and educational sessions, an enormous sponsor expo, and (for those of us in the media world) cocktail receptions and dinners with PR firms and brands. It’s nonstop go-go-go from the second you land. This was my third year attending FNCE, and I was especially excited for this year because it was my first time speaking! For those who are interested in what we talked about and weren’t able to be there, good news – it was apparently recorded and will be available online for download! 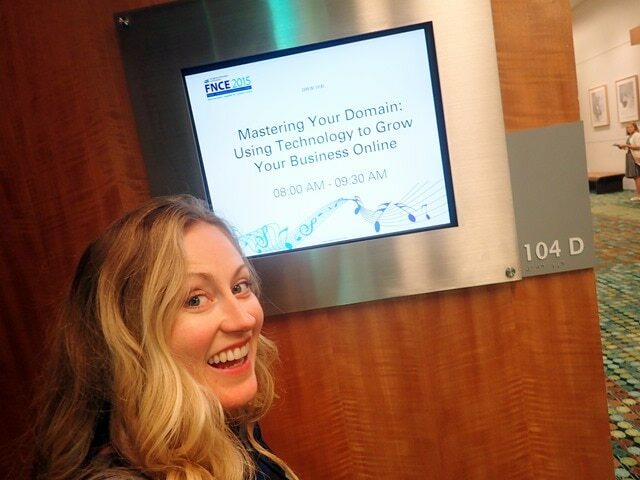 Here is the link to download the session once it’s available (although FYI that I think there is a fee to download the sessions once they are up). I attended a number of conference sessions while at FNCE, but my favorite (besides ours, obviously) was one on Health at Every Size and Motivational Interviewing (<—link to download it when it’s ready). It was wonderful – touched on a lot of the Intuitive Eating approaches that I use in my AnneTheRD practice. 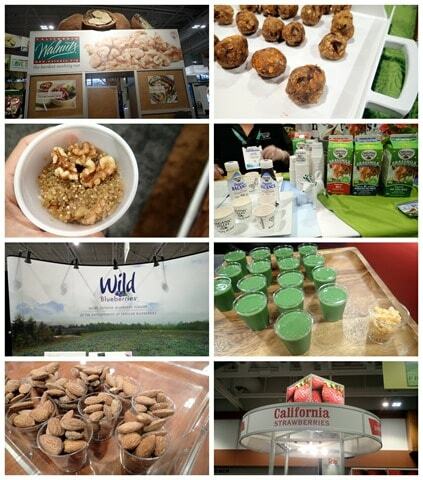 One of the fun things about FNCE is that there is a really large expo where brands pay to exhibit, meet dietitians in attendance, and share samples and product information. While not all the brands in attendance are those I would support, I was happy to see many of my favorites were also in the mix. Saying hi to my Organic Valley friends – including a farmer whose farm I visited back in 2010 on a press trip – and enjoying some Organic Fuel & Balance protein shakes. And much more that went unphotographed, like enjoying avocado with the Hass Avocado crew, eating hummus with Sabra, etc! 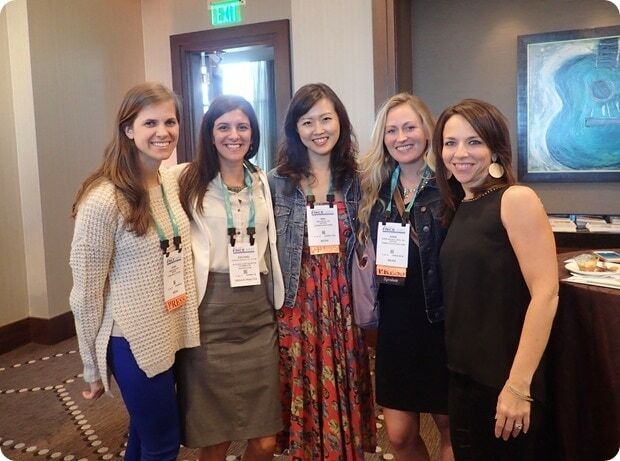 One of the really cool things about attending FNCE as a dietitian that works in media/blogging is getting invited to attend cocktail receptions and dinners hosted by PR firms and brands. Here are some of the fun events I was lucky enough to attend! Daisy Cottage Cheese (love their cottage cheese because of the simple ingredient list – see also: My Favorite Breakfast) hosted a lunch event at a delicious and funky restaurant called Little Octopus. 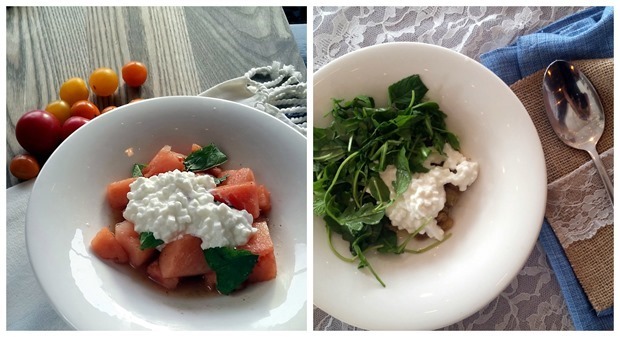 We enjoyed a photography skills and food styling class followed by a cottage cheese inspired lunch! I especially loved their watermelon with cottage cheese and cardamom (such a unique combo), and the savory salad with roasted grapes, fermented chili, tomatillo ver jus, and golden raisins. I want to try to make more savory cottage cheese dishes at home – never think to do that! 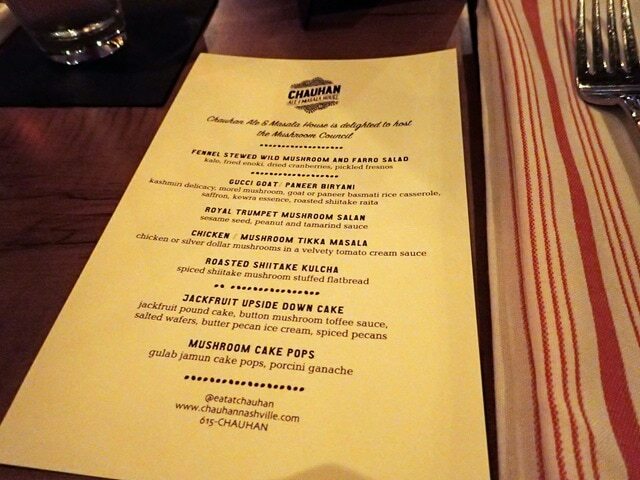 The Mushroom Council hosted an amazing dinner at Chauhan Ale & Masala House. 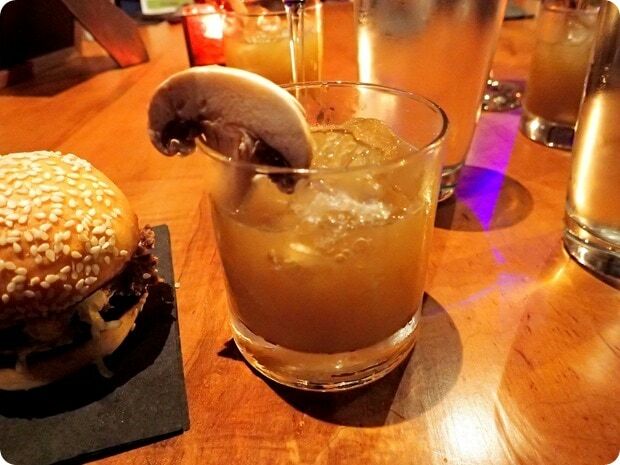 I was really impressed with this restaurant and their creativity with the mushrooms! To start, we enjoyed mushroom cilantro margaritas (no, seriously – they had mushroom powder in them, which you couldn’t taste at all, but which added an awesome Vitamin D punch) and sliders with mushrooms blended in to the meat (that’s one of my favorite tricks too). The dinner was hard to photograph due to dim lighting, sadly, so instead I will share a picture of the menu! The starter farro salad rocked my world, and I’m totally inspired to cook more often with mushrooms now. They are nutrition powerhouses! 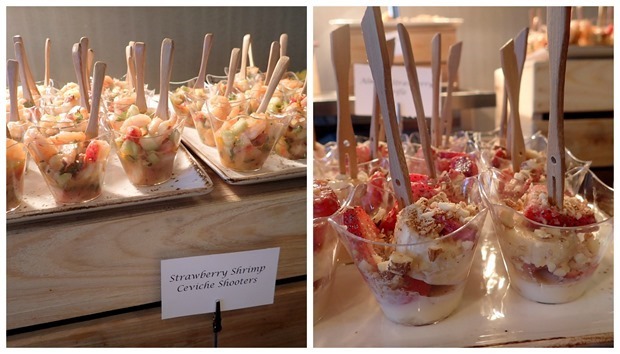 California Almonds and California Strawberries co-hosted a “Made in California” reception. The strawberry and shrimp ceviche shooters (<—recipe) and the mini strawberry almond parfaits were my fave. My Kura protein powder friends (remember them from my Lemon Ginger Berry Smoothie recipe?) hosted a breakfast at a cool spot called Events @ 1418. In addition to the usual eggs and potatoes, we also sampled some amazing smoothies made using their protein powder. I still think it’s the best tasting protein powder I’ve found! 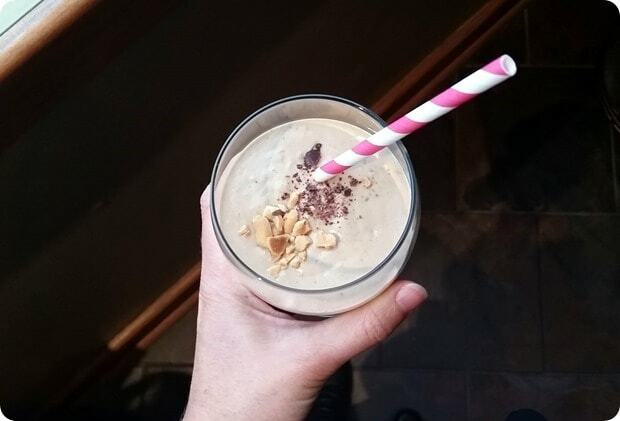 Their “snickers smoothie” (almond milk + frozen banana + dates + PB + 1 scoop chocolate Kura + crushed peanuts and dark chocolate on top) was a big winner. But my #1 fave was an unpictured green smoothie (coconut water + kale + pear + apple + avocado + vanilla Kura). I also loved getting time to catch up with my good friend Heather, who was my roommate for the weekend. 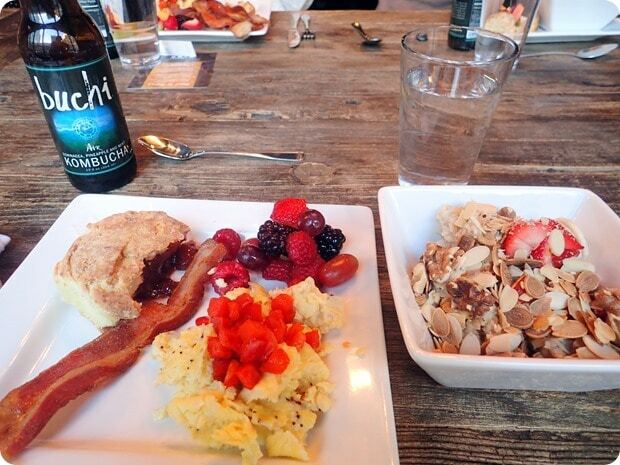 Heather recently started working as Head of Nutrition at Spright, a cool new health/wellness online community, and hosted an early breakfast on their behalf at the Frothy Monkey one morning. 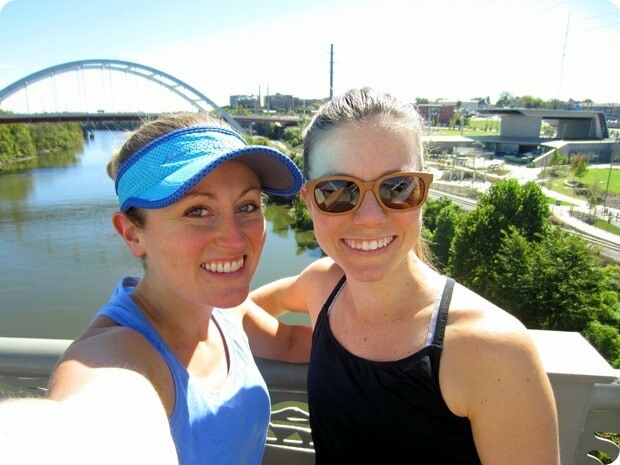 We snuck in a short run/walk afterwards. :) It felt good to get some fresh air and sunshine! 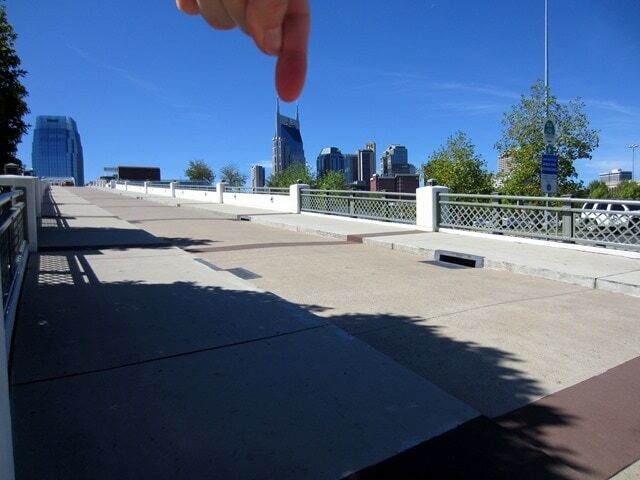 Nice to see a little more of the city, too! Photo below courtesy of Heather, lol. I was also super excited to finally meet Robyn, who I’ve chatted with online for awhile now but had never met until this weekend. I love her blog – she writes a lot about intuitive eating, mindfulness, and self care. We met up for an afternoon walking break one of the days in between sessions/events and ended up spending 2 hours talking nonstop. Love her! 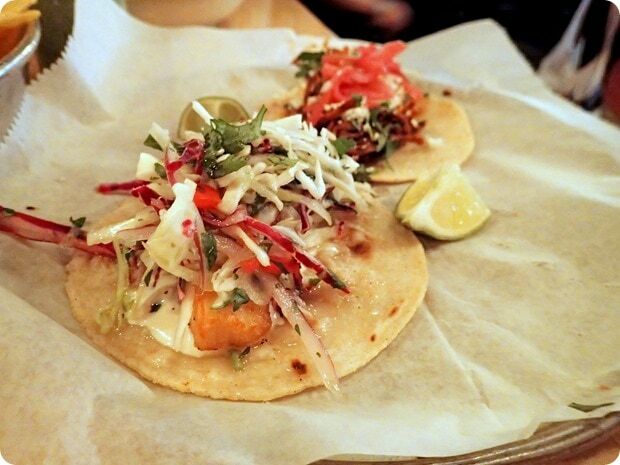 I will end this long post with one final Nashville restaurant recommendation: try the tacos at Bakersfield. I treated my former intern Jackie (who is now a paid contractor working for me a couple hours a week) to lunch there on Sunday and the food was awesome. Great salads, too – I didn’t get a picture but we shared a great cumin-tastic arugula salad to start. Whew. What a FUN and action packed weekend. As you can imagine, I am pretty exhausted now (and quite behind on emails) – but it was definitely worth it. I’m looking forward to next year already! How fun! I would love to go to the mushroom council event! I’m mushroom obsessed! Looks like it was a great trip! I love Bakersfield- they have one in Charlotte and somehow I have only been once! Their tacos and jalapeño margaritas are to die for. Oh man, Bakersfield tacos are incredible! Also, their guacamole is out-of-this-world fantastic! We enjoyed some of the guac too! So good! Looks like you had a blast! Those tacos do look awesome! Agreed! Ditto on Daisy. Their cottage cheese and sour cream (full fat varieties) have no weird ingredients and taste double dog delicious! And, they aren’t outrageously expensive either. Bonus. Great recap Anne! Definitely checking out your presentation once it’s available. So excited that it will be in Boston next year so I can finally go! What a neat gathering! Impressively done, Anne! I live in Columbus, OH, and there is a Bakersfield across the street from me! It actually started in Cincinnati and is expanding. I love their tacos too! Congrats on speaking! Sounds like a great conference. Great recap and so fun to see you at FNCE. Wish we had more time to connect! Likewise! Great to see you, too! 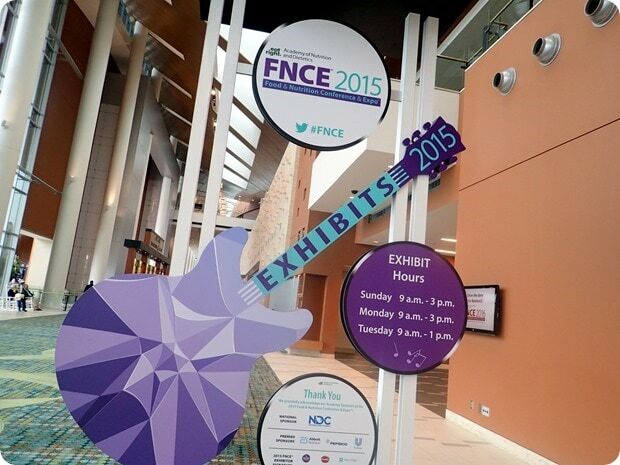 I love FNCE! I haven’t been able to attend in a few years (my babies have always been too small to leave around FNCE time) but it was always such fun! Hah, I was hoping you’d be pleasantly surprised by my random photo shoot ;) The weekend went by too quickly! Good thing I get you back in SF so soon.